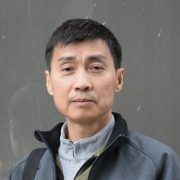 Zicheng Liu is a principal researcher manager at Microsoft AI&R Ambience Intelligence team managing the computer vision science group. Zicheng Liu received his Ph.D. in computer science from Princeton University in 1996. He got his B.S. degree in mathematics from HuaZhong Normal University, Wuhan, China, in 1984, and his M.S. in Operations Research from the Institute of Applied Mathematics, Chinese Academy of Sciences, in 1989. Before joining Microsoft Research, he worked at Silicon Graphics, Inc. as a member of technical staff for two years, where he developed the trimmed NURBS tessellator shipped in both OpenGL and the OpenGL Optimizer. Current research interests include human activity recognition, 3D face modeling and animation, and multimedia signal processing. He has worked on a variety of topics including Steiner trees, average case complexity, linked figure animation, and trimmed NURBS tessellation for large CAD model visualization. Liu has served in the technical committee for many international conferences. He was a member of the Audio and Electroacoustics Committee of IEEE Signal Processing Society. He is the chair of the Multimedia Systems and Applications Technical Committee of IEEE CAS society. He is a steering committee member of IEEE Transactions on Multimedia. He is the Editor-in-Chief of Journal of Visual Communications and Image Representation, and an associate editor of Machine Vision and Applications. He served as a guest editor of IEEE Transactions on Multimedia, and a guest editor of IEEE Multimedia Magazine. He is an affiliate professor in the department of Electrical Engineering, University of Washington. He was an IEEE distinguished lecturer from 2015-2016. He is a fellow of IEEE. Technical Program Co-Chair of 2010 IEEE International conference on Multimedia and Expo (ICME2010), Singapore. Program co-chair of 2014 IEEE International Conference on Multimedia and Expo (ICME 2014). Special issue on Benchmark Evaluation of RGB-D Based Visual Recognition Algorithms (Call for papers), Machine Vision and Applications (MVA). Special issue on Visual Understanding and Applications with RGB-D Cameras (Call for papers), Journal of Visual Communication and Image Representation (JVCI). IEEE Visual Communications and Image Processing (VCIP2012) (Call for papers).